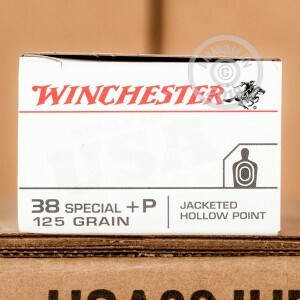 This affordable bulk pack of 500 jacketed hollow points (JHPs) from Winchester will be great to feed your .38 Special pocket revolver, full size .357 Magnum K-Frame, and any similarly chambered wheel gun in between for both match use and personal defense. This ammo is rated "+P" so please make sure your revolver can handle that level of pressure before use. Winchester is a trusted name in American ammunition and firearm manufacturing and has been in business for nearly a century and a half. They draw from a plethora of experience and combine it with the most efficient modern production methods in order to offer shooters great ammo at a fair price. These JHPs possess a copper jacket that extends up the length of the bullet and stops short to leave an exposed lead tip with a hollow cavity. This construction ensures the bullet will expand while penetrating in a target even if fired at lower speeds from short barreled revolvers. The 125 grain bullet is on the lighter side for this caliber and produces very manageable recoil even when placed in front a +P charge. This same cartridge makes for an easily controlled practice or match round in large framed revolvers. 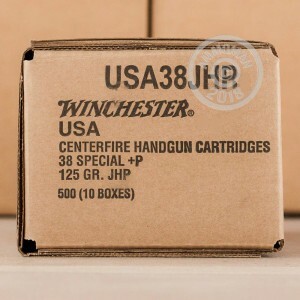 The JHP bullets reside in reloadable brass casings fitted with Boxer primers. These rounds leave the muzzle at 945 feet per second while possessing 248 foot-pounds of energy which is well retained and measures at 224 foot-pounds at 50 yards.